Congratulations to the Baker County Chapter for another great OSWA annual meeting. 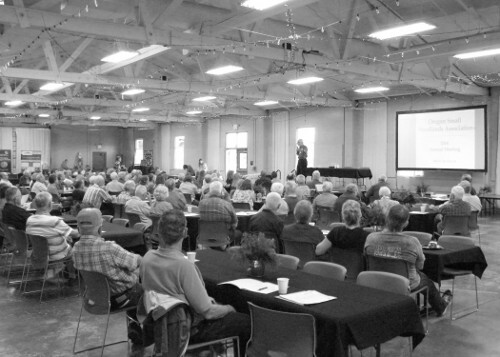 On Friday, June 10th, an exceptional group of speakers discussed the resilience of Northeast Oregon, before and after fire, and a multiple list of challenges facing family forest owners and how one might address these issues, all was with an emphasis on the 75th Anniversary of the American Tree Farm System. During the Membership Meeting, President Scott Hanson (Clackamas County) passed the president’s gavel to new President Rick Barnes (Douglas County). Rick will serve a two year term as President and Scott will become Past-president on the Executive Committee. Scott Hayes will step down from the Executive Committee after serving for six years. Thank you Scott for your service to OSWA. Mike Barsotti (Linn County) was nominated for President-Elect and Mike Barnes (Yamhill County) was nominated for a second term as Second Vice President. During the awards banquet, OSWA recognized eleven Outstanding Chapter Volunteers and three 2016 Riggin’ Slingers. 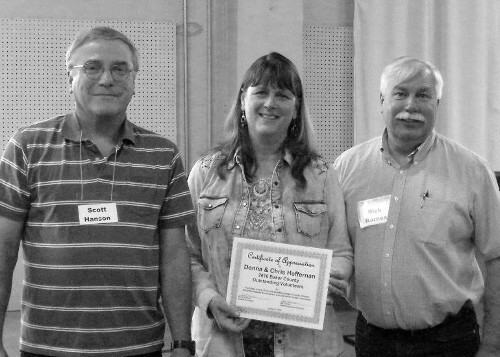 Oregon Tree Farm System recognized Mike Cloughesy, Oregon Forest Resource Institute and Jim Johnson, OSU Forestry Extension as exceptional partners of the American Tree Farm System (ATFS), Paul Calverley received a 25 year ATFS sign, and Rick and Audrey Barnes received a sign as 2014 Western Regional Outstanding Tree Farmers of the Year. Two woods tours, an awards banquet, and a silent auction completed the three day event. Over 175 people participated in one or more of the events. Also, thank you to the annual meeting sponsors Boise Cascade, Guistina Resources, JD Fulwiler, Port Blakely, RSG, Seneca, Silke Communications, Starker Forests, Stimson Lumber Co., and Weyerhaeuser. Each Year, chapter presidents are asked to identify an outstanding volunteer for their chapter to be recognized at OSWA’s Annual Awards Banquet. Chris & Donna Heffernan have been active volunteers on the tree school East planning committee. Donna has been one of our key Tree School East planning committee members since the program was started in 2002. In addition to attending the planning meetings and providing much valuable input, the Heffernan’s have contributed logs for classes, volunteering at the registration table and anything and everything else that needs doing. The Heffernans are assisting with a new program studying the economic feasibility of creating BioChar from forest residue. Chris, Donna and their two sons Justin and Sheldon all work together managing the family’s considerable forestry and farming businesses which include custom haying and forest fuel reduction with their slash buster equipment. They set a great example for others. 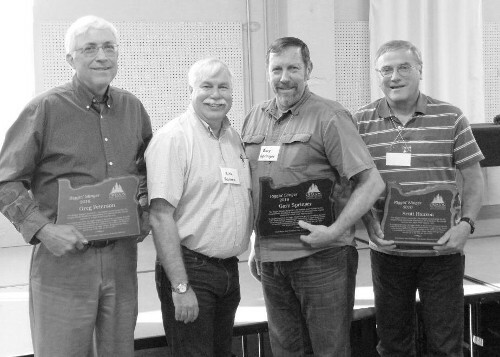 The Heffernans were the Union County Outstanding Tree Farmer of the Year in 2004 and are voluntary participants in the My Blue Mountain/East Face program. They have hosted numerous tours and forestry and agriculture workshops on their lands, providing superb learning opportunities and inspiring the audiences with their dedication and excellent work. Chris and Donna have a long history of engaging with and supporting their community in a variety of unique ways such as offering special deer and elk hunting opportunities for disabled and disadvantaged people of all ages. Chris is a past member of the Board of Forestry. They often say, they’re “living the dream” and inspiring other folks to also passionately pursue their natural resource stewardship goals. Roger Workman joined the Benton County OSWA board in 2015. Even though he lives and works full-time in Albany he has taken the extra time to come to Corvallis to volunteer. Roger enthusiastically accepted the job of Program Coordinator and has organized interesting monthly events to appeal to a variety of interests. The chapter is pleased with his efforts. He has made a notable contribution to the Benton County chapter and we’d like to honor him as our Volunteer of the Year and hope he continues as Program Coordinator for another year! Tim Dahl is our outstanding volunteer for 2016. Tim has been invaluable to CCFFA for the time he puts in as Secretary/Treasurer, keeping track of what we are doing and where we are going. He is on the finance committee, works with Jim Schreiber on the burn committee and on tours where needed. He is a Master Woodland Manager. Columbia County outstanding volunteers are Scott and Sue Russell. What can I say. It is long overdue that the Russell’s are recognized. Columbia County Past president, vice president, secretary, always there to help with a great attitude, a smile and something funny to say. They have been active in state events like Day at the Capitol and Board of Forestry meetings, representing Columbia County. Jayson Wartnik is the past president of the Coos/Curry County chapter. As president he spent countless hours volunteering to set up tours and lead chapter events. 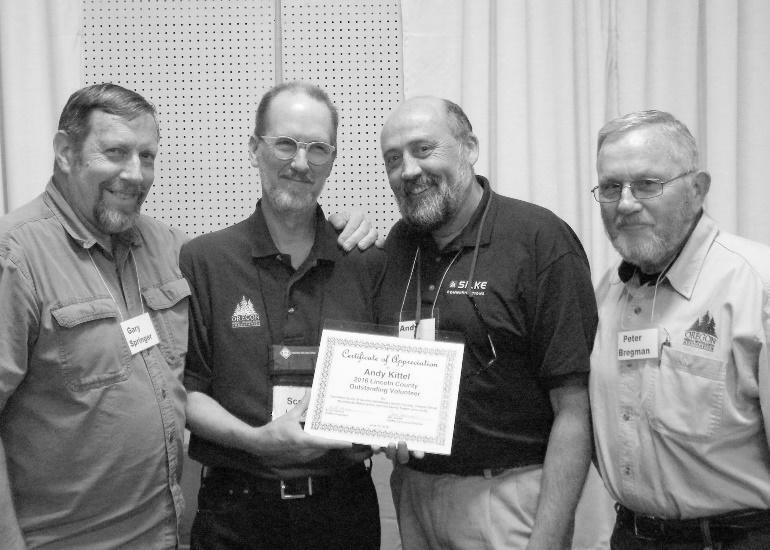 He continues to serve on the chapter board and participates in most chapter activities. Jayson has been a key player in the chapters recent success. Colene Freadman is the 2016 Outstanding Volunteer of the Year for the Douglas County Chapter. For years, Colene has been a willing worker for our chapter, filling in where needed and assisting when times get busy—for instance, when we hosted two OSWA Annual Meetings in a row. In addition, we have on-going gratitude for her leadership in securing a bond measure that provides permanent funding for the Extension Forestry program in Douglas County. Most recently, Colene accepted the on-going job of updating and managing the Douglas County portion of the OSWA website. This is a very important communication tool and she is doing a fabulous job of keeping it current and accurate. Thank you Colene for your energy and helpfulness. You help make our Chapter a success! The Lane Chapter recognizes Steve & Wylda Cafferata as volunteers of the year. They have both been committed to volunteering for LCSWA’s events. Steve providing members professional input on forest management processes and Wylda with the planning and coordinating of field events. Over this past year both have committed many hours of their time and services to LCSWA, which we are very thankful for and appreciative of. Steve also volunteers his time as a member of the state’s Emergency Fire Funding Committee representing family forest owners. His experience has been needed as Oregon has experienced three bad fire seasons in a row. Andy Kittel is the Lincoln County Outstanding Volunteer. As an active member of the chapter board Andy provides advise and leadership on the many issues the chapter needs to address. He volunteers his time to make sure OSWA at the state level is successful as well as the county chapter. He actively participates in chapter and state level events and can be counted on when needed to make an OSWA event successful. Money earned from our annual Seedling sale is used, in part, to provide college scholarships to deserving Linn County students who major in forestry or other related fields. For more than ten years Katie Kohl has been our Scholarship chairperson, managing this program. Katie works with advisors at each of our areas high schools to insure that we have the best pool of candidates possible and then oversees the selection process. Linn County members get a chance to meet our scholarship recipients at our annual meeting when they are introduced by Katie and relate their experiences. Katie has remained active in both the Oregon Small Woodlands Association and her community. She has served as a board member and has been secretary of our chapter. She has also consistently helped with our seedling sale and the associated “Goods from the Woods” display. Currently she is a board member of the South Santiam Watershed Council, a U.S. Forest Service outdoor school steward, and a member of the Sweet Home Tree Commission. Washington County Volunteer of the year is Bill Triest. Bill presently heads up our program committee and has had that role for the last 6 years at least. In that capacity he, along with the rest of the program committee, organizes the topics for our monthly meetings, identifies and coordinates with speakers, assists with publicity for the meetings and introduces speakers to our members at the meetings. He pays careful attention to the topics presented so we get a wide variety of program topics for our members to enjoy. Typically, our meetings are well attended and a big reason for that is the careful consideration that Bill gives to what is being presented. Identifying tour opportunities for the summer is another responsibility of the program chair and Bill has also come through for us on that. We’ve visited a number of interesting sites over the past several years. In addition to being the program chair Bill has also served as a board member in the past, volunteered with our annual plant sale, and has attended numerous small woodlands events. He is dedicated to his tree farm and dedicated to our organization and we appreciate the work he has done for the Washington County Small Woodlands Association. 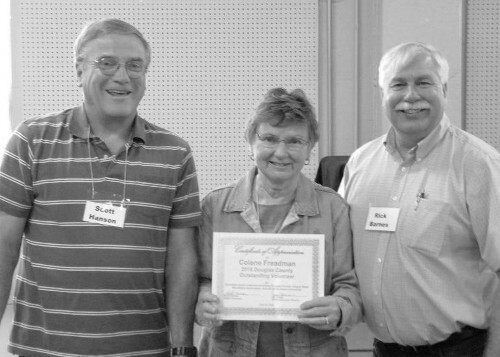 The Yamhill Chapter Small Woodlands Association’s volunteer of the year is Susan Watkins. She is very involved in our local chapter having served on our Board of Directors and has given countless updates at our chapter meetings on various forest and important local issues. Susan has been a member of the Department of Forestry’s Committee for Family Forestlands from 2008-2015 and was acting chair in her final year. As a member of the Committee for Family Forestlands, Susan helped organize an Oregon Board of Forestry tour of western Oregon tree farms. She was a co-author of the “Ties to the Land” succession planning program, which has been in use in Oregon and across the country for the past decade. Susan has spoken at a number of Board of Forestry and State Legislative hearings on behalf of small forest owners. She is a Master Woodland Manager (2002 class). Susan has twice written “op-ed” articles about forestry and small forest organizations for her local newspaper, the Yamhill Valley News Register. She has also given presentations on Oregon resources for small forest landowners at OSWA and WOWnet meetings and 5th graders at the Cruickshank Woodland tour. 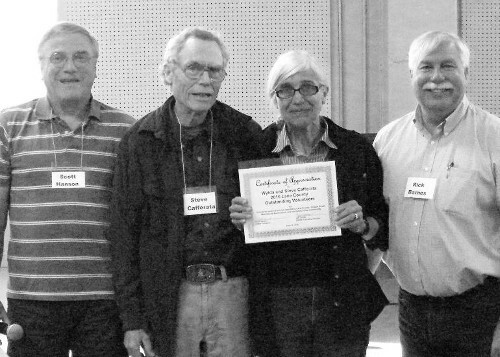 Oregon State University College of Forestry Extension has honored Susan for her volunteer services on behalf of small woodland owners. Susan and her husband, Arnie Hollander are Yamhill County’s Tree Farmers of the Year for 2016. We are indebted to them both for their service. Each year OSWA selects an OSWA leader as the Riggin’ Slinger. A Riggin’ Slinger is responsible for all the activities in an active high leading logging operation. Things can go wrong and the Riggin’ Slinger is the one who solves problems and keeps everyone safe while meeting the overall objective of keeping logs moving to town. OSWA will recognize three Riggin’ Slingers in 2016. Scott Hanson has served as President for the last two years at a time when OSWA had a multitude of challenges. The Board of Forestry’s riparian rule making process, a contentious 2016 legislative session, and keeping OSWA healthy financially and growing the OSWA membership. Under Scott’s leadership OSWA had a big impact on the Board of Forestry’s riparian rule decision as he led OSWA’s Water Quality Team, we survived the challenges at the capitol, membership grew in both of the last two years, and OSWA’s financial condition is healthy. Scott has demonstrated the skills of a Riggin’ Slinger. Greg Peterson was key in OSWA’s approach to influencing the Board of Forestry’s riparian rule making process. OSWA’s Water Quality Team made countless testimony to the Board of Forestry. Greg Peterson was a work horse on the team. He spent over 1000 hours of time reviewing the results of the RipStream study, preparing professional testimony to the Board of Forestry on the short comings of the study, and together with the team influenced the outcome in a way positive for forest owners. Greg has also represented OSWA’s interests in the Department of Environmental Quality’s Mid Coast Total Maximum Daily Load (TMDL) process. Greg has demonstrated the skills of a Riggin’ Slinger. Gary Springer has been a leader and advocate for family forest owners for decades. Past member of the OSWA board, actively engaged in the Board of Forestry’s riparian rule making process in the 1990’s, member of the Board of Forestry appointed Committee for Family Forestlands (CFF) who advises the board on family forest issues, and most recently a member of the Board of Forestry. He was the only member of the board with any practical forestry experience when they recently made their decision on the riparian rules. There is no doubt, without Gary’s leadership during the riparian rule making process, forest owners in Oregon would have been unnecessarily harmed by regulation not supported by science. Gary’s interface with the Environmental Quality Commission greatly influenced the outcome. Gary received the Riggin’ Slinger award in 1999 and he has not slowed down. Gary continues to demonstrated the skills of a Riggin’ Slinger. This year’s Silent Auction brought in about $3400 that will be used to support OSWA’s regulatory and legislative issues. Participants had a broad range of items to bid on. Thank you to all who made donations for the silent auction. Also, thank you to all who bid on and purchased the items. 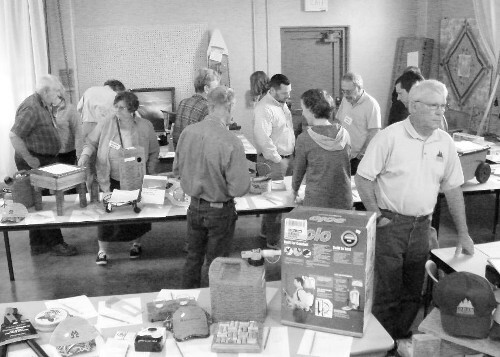 The Silent Auction revenue has become an important part of OSWA’s annual budget. Special thanks to Chair Ilene Waldorf, Denise Russell, Jan Oyala, Jen Rains, Coleen Freadman, and others who helped on the auction. In celebration of Port Blakely Tree Farms LP’s 150th anniversary Port Blakely and OSWA are offering college scholarships for up to $1000 to the children and grandchildren of OSWA members who are enrolled in a natural resource college Winter Term 2015. The scholarships are available because of a gift from Port Blake. Letter of recommendation from someone aware of the student’s interest in natural resources such as a parent, grandparent, councilor, employer, etc. An OSWA Scholarship Committee appointed by the Executive Committee will determine how the scholarships are distributed. It is intended that the successful applicants will receive their scholarships sometime in 2015 during the Winter Term. Application deadline is February 25, 2015. Applicants do not need to use an official application form, but one is attached to link (**see below**). Port Blakely has been a longtime supporter of family forest values and a member and supporter of OSWA. They are also a Gold OSWA Patron. Port Blakely Tree Farm is part of the Port Blakely Companies which was founded in 1864 on Bainbridge Island in Washington as Port Blakely Mills. Port Blakely Companies share a common set of values – integrity, respect, quality, innovation, and environmental stewardship. They have a history of supporting family forest owners in Oregon and Washington in a variety of ways. For a printable copy of this information, click here. Feel free to contact us to find about attending events, joining activities, education opportunities,tree sales and fun with the Clatsop Chapter of the Oregon Small Woodlands Association!